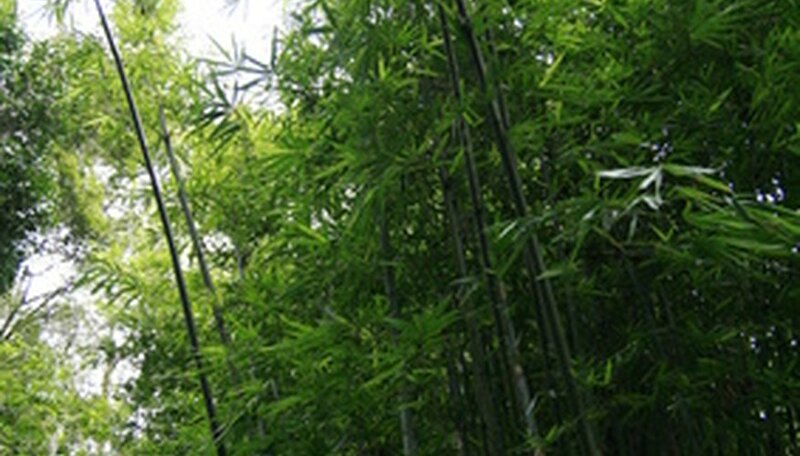 Golden bamboo grows rapidly, and it is useful in situations where you want to create a privacy screen quickly. It is a running variety of bamboo, meaning that it will extend its root system underground over a large area. It will then send up bamboo shoots from the roots. Golden bamboo is hardy in U.S. Department of Agriculture Climate Zones 6 through 11, so it will do well in parts of the Southwest where the summer temperature does not get colder than 60 degrees Fahrenheit. It may need extra watering in dry areas. Identify a good location for your bamboo plants. Since golden bamboo is a running bamboo and has shallow roots, it is susceptible to damage from heavy wind; look for a place where it will be sheltered. Also, it can be hard to contain golden bamboo, so it is important to plant it in a contained area of some kind. Look for an area surrounded by driveways, sidewalks, paths or road. Test the soil to see whether it is appropriate for bamboo. You can determine the water-draining ability of the soil by taking a handful and squeezing it; if drops of water come out, the soil does not drain well enough for bamboo and you will need to add sand. Also, check to see whether the soil is rocky. Bamboo does not do well in rocky soil. Remove any weeds in the desired area. Use the rototiller to cultivate the soil to a depth of 1 1/2 feet. At this time if the soil is not well-drained, add sand. Adding up to one-10th of the current soil volume in sand will ensure good drainage. If the soil is acidic, add 700 to 1,000 pounds of lime per acre. Till these amendments into the soil. Use a trowel to dig a hole between 1 and 2 inches deep. Place the rhizome into the hole, and cover it with loose dirt. Repeat this process for other rhizomes if you have more than one. Construct barriers to surround the bamboo if there are none previously established. Dig trenches between 2 and 3 feet deep and fill them with horizontal rows of polyvinyl chloride, or PVC, pipe. Rocks or concrete may also be used. Water the plants frequently enough to keep the soil moist. Once the plants have sprouted, cover the ground with mulch to keep moisture in. After the plants have become established, reduce watering frequency and allow the soil to dry after watering. If the leaves start to curl up, you are not watering enough.